So I thought I was going to be all smug and self righteous this summer and not post a salad. Since salads weren't really floating my boat these past few weeks... For some reason, I apparently thought this made me rebellious. I am unable to account for how I got this notion. I picked up some kale at the farmers market recently, and thought to myself, I'm going to make some fresh pasta and then toss it with the kale and some other things. That sounds yummy! Then it got hot. And stayed hot. Like, oh my god, I wish I had an air conditioner hot. We live near the ocean; we're not supposed to get hot like this! Come back ocean breeze! My tolerance for heat must have plummeted since moving here... But anyway, I realized that rolling out some homemade pasta would be like a mild form of midieval torture, which cooking really shouldn't be. So I made a salad to use up the kale, and surprisingly (or not surprisingly), I really liked it! For the salad: Fry up bacon slices on a griddle over medium heat. Once both sides have crisped, remove from griddle and place on a paper towel. Place kale, scallions, plums, Parmesan cheese, carrots, and walnuts in a medium-sized bowl. Chop the bacon pieces, and those into the bowl as well. Toss everything together. For the dressing: Place everything in a food processor and pulse a few times until it all comes together. Then drizzle over the salad and mix together. Now this sounds just plum good! I'm glad you broke your own rule. This salad is beautiful! Your refusal to post a salad is totally amusing! I don't post them super-often, but sometimes a salad is the perfect answer to the dinner conundrum. What a great use of kale! This kale salad looks so good and healthy! Plum salad dressing? That sounds delicious!!! I'm glad this salad worked for you! At least it shouldn't be hot for too much longer. Love the idea of using plum in this salad! Bet it adds the perfect touch of sweetness to balance it! I love this dressing, and such a great salad! Happy that you broke down and did this, but sorry about the heat. I am at the ocean as well, and really it has been bizarre with the heat lately. Of all the salads we had at home, we have never incorporated plums. And this is definitely something I like to introduce to my family. Super light and tasty too. Has Yumm factor written all over it. Have a good weekend Jenn! I love the combination of flavours and colours in this! I love everything about this salad. I'm a total kale junkie! This is such a great salad and so healthy. I especially love the dressing. Lovely salad. I love the dressing, too - it sounds really good! Love the idea of pairing kale with plums and your dressing sounds incredible!! A must try for sure :) thanks for yet another lovely 'recipe!!! I am definitely a salad person. 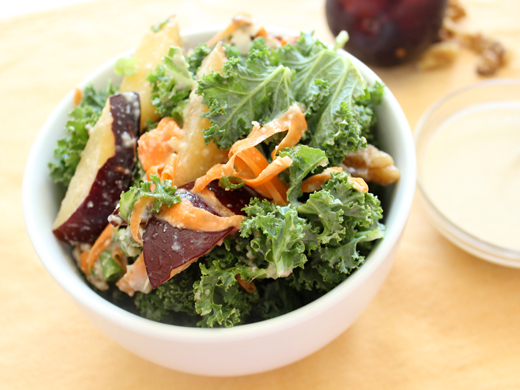 This kale salad looks particularly delicious with stone fruit and nuts! Love this salad - plum dressing is very unique. I love kale salads! And, I've been going crazy for plums lately. That makes this a win-win! I seriously love everything about this salad. It definitely screams summer! Wow, I love this! Such a unique flavor that I wouldn't be able to come up on my own. I love how you put all these ingredients together and I'm very interested in trying this. Plum in dressing, this is a must try for me! Haha love your resolve. ;) I don't post salads much, but it is still winter where I am. Your salad is a keeper! I'll remember to try it when it gets to summer here. I don't know how I missed this lovely salad, I am a huge salad lover and you used kale, wonderful. That dressing is fantastic. Here from Carole's site. You got me at the kale.